listen)[need two versions of this: for Bokmål and Nynorsk]. 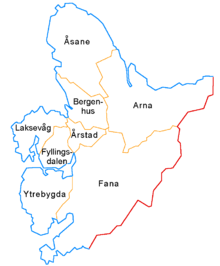 The Old Norse forms of the name were Bergvin and Bjǫrgvin (and in Icelandic and Faroese the city is still called Björgvin). 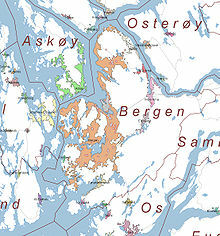 The first element is berg (n.) or bjǫrg (n.), which translates as 'mountain(s)'. The last element is vin (f.), which means a new settlement where there used to be a pasture or meadow. The full meaning is then "the meadow among the mountains". 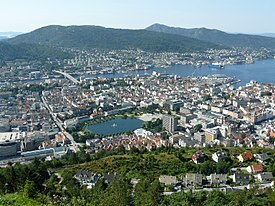 This is a suitable name: Bergen is often called "the city among the seven mountains". 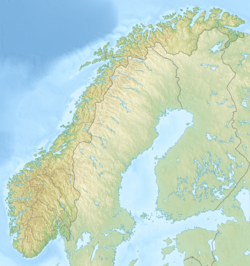 It was the playwright Ludvig Holberg who felt so inspired by the seven hills of Rome, that he decided that his home town must be blessed with a corresponding seven mountains - and locals still argue which seven they are. 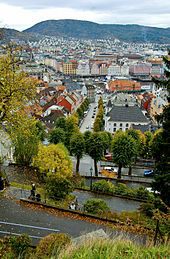 Bergen is considered to be the street art capital of Norway. Famed artist Banksy visited the city in 2000 and inspired many to start creating street art. Soon after, the city brought up the most famous street artist in Norway: Dolk. His art can still be seen in several places in the city, and in 2009 the city council choose to preserve Dolk's work "Spray" with protective glass. 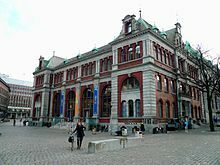 In 2011, Bergen council launched a plan of action for street art in Bergen from 2011 to 2015 to ensure that "Bergen will lead the fashion for street art as an expression both in Norway and Scandinavia. [check quotation syntax] The Madam Felle (1831-1908) monument in Sandviken, is in honour of a Norwegian woman of German origin, who in the mid-19th century managed, against the will of the council, to maintain a counter of beer. A well-known restaurant of the same name is now situated at another location in Bergen. The monument was erected in 1990 by sculptor Kari Rolfsen, supported by an anonymous donor. Madam Felle, civil name Oline Fell, was remembered after her death in a popular song, possibly originally a folksong, "Kjenner Dokker Madam Felle?" by Lothar Lindtner and Rolf Berntzen on an album in 1977. ^ a b "Cruisestatistikk". Cruise (in Norwegian). 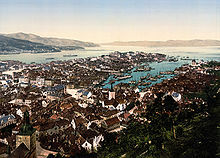 Port of Bergen. 2016. Archived from the original on 26 May 2015. Retrieved 8 January 2016. ^ a b Tom R. Hjertholm (16 December 2013). "- Tørrfisken vender hjem". Bergensavisen. ^ "The rainiest city in Europe. Allegedly". eugene.kaspersky.com. Retrieved 12 March 2019. 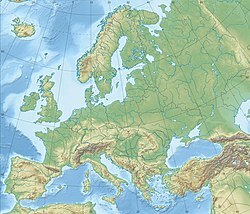 ^ "Europe and the United Kingdom Average Yearly Annual Precipitation". www.eldoradoweather.com. Retrieved 12 March 2019. ^ "BERGEN - FLORIDA Climate Normals: 1961-1990". National Oceanic and Atmospheric Administration. Retrieved 16 March 2014. 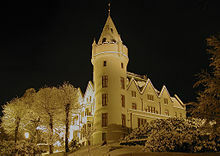 ^ "Bergen, City of Gastronomy - Havbyen Bergen". 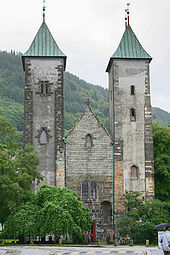 marin.bergen-chamber.no. Retrieved 3 October 2018.